Vernon Odom on his last day at 6ABC. When Vernon Odom arrived in Philadelphia in 1976, Frank L. Rizzo was mayor, and the city was getting ready for the celebration of the nation’s 200th birthday. “I was here the week Rizzo announced, ‘I need [15,000 federal] troops to maintain order during the Bicentennial,’” Odom, 70, recalled Friday, chuckling, as the longtime 6ABC reporter took some time out of his last day before retirement to reminisce about more than four decades covering the news in Philadelphia and around the world. It’s a period that’s seen tremendous changes in both the city and the TV news business, but through it all, Odom’s been a steady, deep-voiced presence, someone viewers could trust to put the story first. It’s one of the things the 1970 Morehouse College graduate said he learned during his postgraduate studies in broadcast journalism at Columbia University. “He understood the job of a reporter, and he never let his personal feelings affect the job that he did. And that’s awfully hard to do. You have to be a terrific professional to do that. It’s something that I’m not sure I could’ve ever done if I had his job,” former Gov. Ed Rendell said Monday. “I just always remember being happy to see him,” said Mike Dunn, who frequently worked alongside Odom on stories during the 25 years Dunn spent at KYW Newsradio, 19 of them at City Hall. Odom’s “to-the-point questions” of elected officials or attorneys in trials he covered sometimes made those being questioned “squirm a bit, but he got right to the point. He didn’t mince words or beat around the bush,” Dunn said. In his years on Action News, Odom’s reporting took him from Philadelphia’s neighborhoods and the surrounding suburbs to hot spots like Somalia, where he covered the invasion in 1992, and post-Cold War Russia, where Mikhail “Gorbachev had just taken over.” He was sent to El Salvador, to South Africa for the release of Nelson Mandela and the country’s first free elections, and to Europe to cover the aftermath of the 1991 release of Norristown native Joseph Cicippio, who had been flown to Germany after five years of being held hostage in Lebanon. “Vernon, more than anybody else in the city, in the TV business, understood politics,” said Rendell, one of the seven Philadelphia mayors during Odom’s Action News tenure. “He was such a likable guy. Even when he was doing a story that had negative connotations for you as a political entity, you couldn’t help liking him, and you couldn’t help answering his questions. Odom, who last month was honored by the Broadcast Pioneers of Philadelphia as the group’s Person of the Year, is married to former Inquirer reporter Wanda Motley Odom, with whom he has two children, a 23-year-old daughter and a 21-year-old son. He was born in Atlanta and largely grew up in Akron, Ohio, the son of Vernon Odom Sr., a social worker, and Sadie Harvey Odom, a scientist. His sister, Maida, who was a longtime reporter at the Inquirer, now teaches journalism at Temple University. A street in Akron is named after their father, a civil rights activist who also graduated from Morehouse, where one of his classmates was the Rev. Dr. Martin Luther King Jr.
Odom’s great-grandfather, B.T. Harvey Sr., launched the nation’s second African American-owned newspaper, the Columbus (Ga.) Messenger. Odom began his broadcasting career working at a radio station in Atlanta while he was still in college, and his first big news story was the King assassination in 1968. Hearing that the civil rights leader had been shot, he grabbed a tape recorder and drove over to the King house, Odom said, and managed to get a brief interview with widow Coretta Scott King as she was leaving the house, and later talked to her at the airport. “I had the first and only interview with Mrs. King for a few days,” and it was picked up nationally. He later moved into TV, and before coming to Philadelphia spent six years as a reporter, anchor, and talk-show host at the ABC station in Atlanta. Vernon Odom works Friday in the 6ABC newsroom. He retired Friday after 42 years. 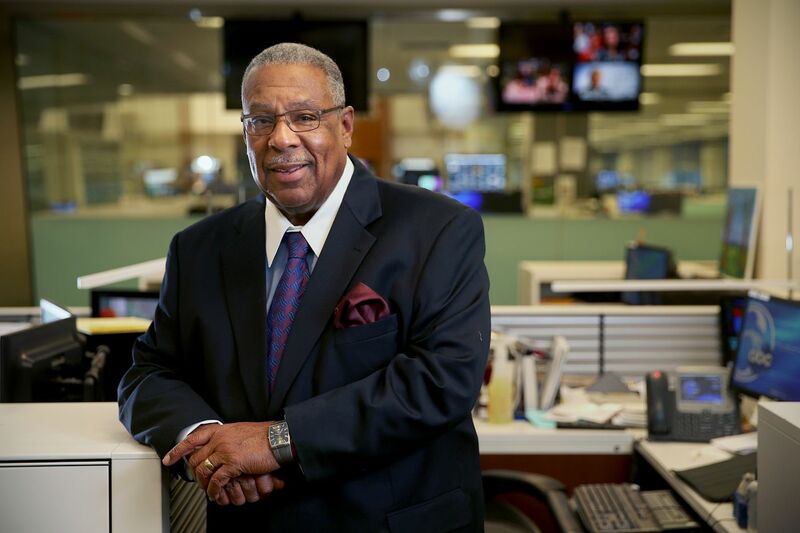 In more than 42 years at Action News, Odom’s seen big changes in Philadelphia. Still, in the decades since, “the Police Department has dramatically changed. It’s one of the best I’ve ever seen now, due to the reforms and things like that. The old spaco il capo [Italian for “break their heads”] crowd is really gone, retired. … It’s a whole new Police Department. Younger in many cases, better educated, better trained,” Odom said. Though Odom cherishes memories of "smaller stories, where I thought I actually accomplished something for someone,” the ones that have haunted him involved violence. “I’ve had to interview so many people who’ve lost their children to violence, or their mother or father to violence or things like that. And that’s the ongoing story for me, just the awful carnage in the streets of the city. It’s been terrible, and it’s affected me,” Odom said. Before he became a father — he didn’t marry until he was 45 — “at night, I could sort of leave it behind. I would get my Chinese takeout food and go home and … watch the ballgame.” But after their daughter was born, “I covered a story of a woman in Brewerytown who starved her young child to death in the basement over a several-month period … and I became far more angry.” He said his colleague John Rawlins told him, “‘It’s different, because you were remote from it before … but now you’ve got skin in the game.’"
Odom may not be reporting for Action News any more, but it doesn’t sound as if he’s planning to slow down much. As for the viewers he’s leaving behind, “I’m deeply grateful to the people of this entire area — the Philadelphia area and South Jersey and Delaware — for their tremendous support of me, and acceptance of me and my work over the years."